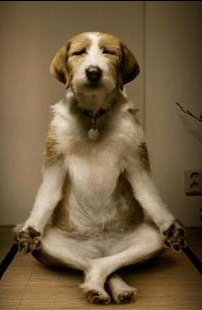 Thank you for the positive feedback on the Pilates and Mindfulness article I posted recently. I’m pleased it proved to be a helpful introduction to mindfulness. 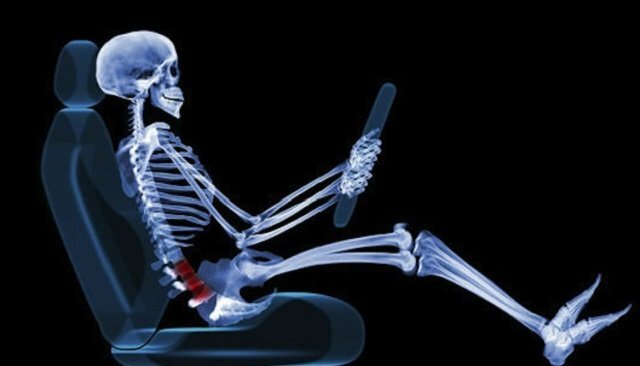 A number of clients have asked for advice on how to ensure good posture when driving. Significant stress can occur in the neck and the upper and lower back as a result of sitting incorrectly when driving, particularly for prolonged periods of time. 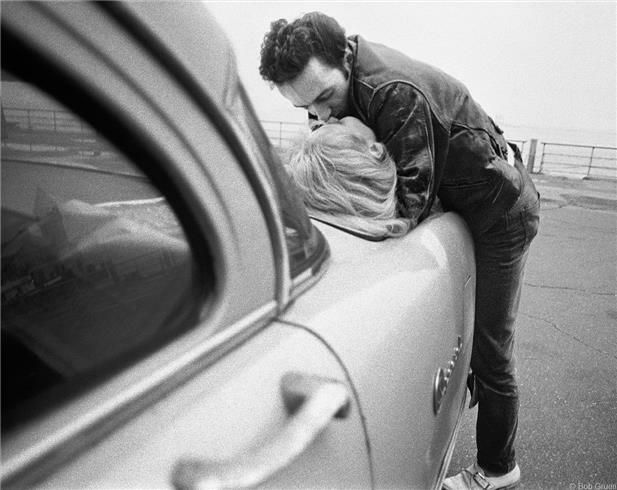 Those who drive cars as part of their job, for example, sales people, are at particular risk. This risk is increased for those who drive for 20 hours per week or more (Porter and Gyi, 2002). High exposure drivers are considered to be those who drive more than 25000 miles a year, or for more than 4 hours a day. Driving forces us to sit in a constrained posture. In addition, the car is increasingly being used as a mobile office (e.g. using a laptop and making telephone calls), which has other associated health risks. Research shows that within a group of business drivers, 65% reported low back pain, 43% neck problems and 40% shoulder discomfort (Gyi et al., 2003). Vary your work activities as much as possible during the day so that your posture changes. Try not to keep the same role for more than four hours. Take a break from driving every couple of hours. Make sure you get out of the vehicle as often as possible, move about and carry out small stretches if you can. When you’ve been driving for a long period, avoid doing any sudden intense physical activity (such as lifting, bending or stretching) without warming up first. Make small adjustments to your driving position at regular intervals throughout your journey. Ensure you are sitting correctly. See image (moustache best avoided…yikes!) and step-by-step guide below. Steering wheel fully up and fully forward. Seat height at its lowest. Seat cushion tilted so that front edge is in lowest position. Back rest approximately 30 degrees reclined from vertical. From this initial set-up position, follow steps 1-8 below. 1) Raise the seat as high as is comfortable to improve your vision of the road. Check you have adequate clearance from the roof. Ensure you have maximum vision of the road. 2) Move the seat forwards until you can easily fully depress the clutch pedal and the accelerator pedal. Adjust the seat height as necessary to give good pedal control. 3) Adjust the seat cushion tilt angle so that the thighs are supported along the length of the cushion. Avoid pressure behind the knee. 4) Adjust the backrest so it provides continuous support along the length of the back and is in contact up to shoulder height. Avoid reclining the seat too far as this can cause excessive forwards bending of the head and neck and you may feel your thighs sliding forwards on the seat cushion. 5) Adjust the lumbar support to give even pressure along the length of the backrest. Ensure lumbar support fits your back, is comfortable with no pressure points or gaps. 6) Adjust the steering wheel rearwards and downwards for easy reach. Check for clearance with thighs and knees when using pedals. Ensure display panel is in full view and not obstructed. 7) Adjust the head restraint to ensure the risk of injury is reduced in the event of a car accident. 8) Adjust the rear view and side mirrors ensuring that they can be used without excessive straining of the neck or upper body. Repeat steps 1-8 and fine tune as necessary. 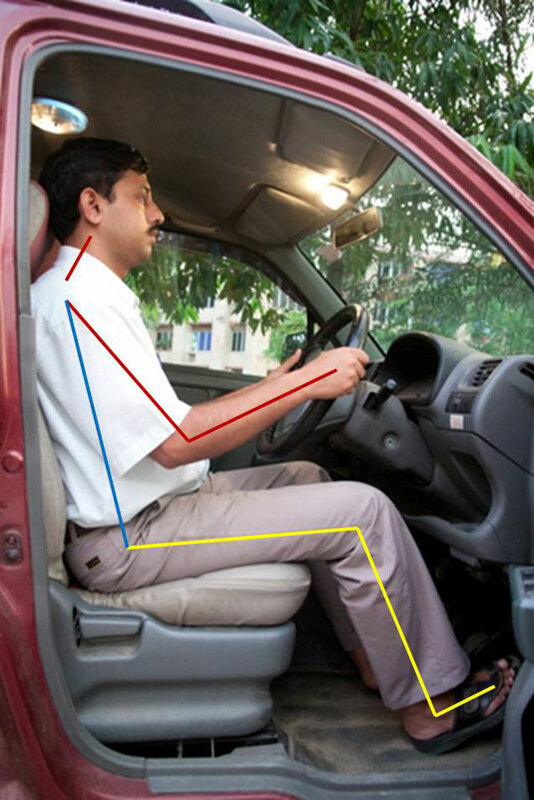 A number of vehicles are limited in the adjustments that can be made to the seat and will therefore not allow you to achieve the best driving posture. Equally, some cars may cause you to adopt a coping posture. For example, limited headroom forces a reclined posture, making reaching the steering wheel a problem. This, in turn leads to excessive forward bending of the head and neck and a slouched posture. Try to choose a car that is best suited to your size and one with as much flexibility as possible to adjust the sitting position. Source: Vehicle Ergonomics – Best Practice Guide, Loughborough University for the Highways Agency. Mindfulness means maintaining a moment-by-moment awareness of our thoughts, feelings, bodily sensations, and the surrounding environment. Practising the Pilates Method has a useful role to play in encouraging us to be mindful thanks to its emphasis on focusing the mind, on coordinating the movements of different parts of the body simultaneously, on timing those movements with the breath, and being aware of how the body feels when we move. 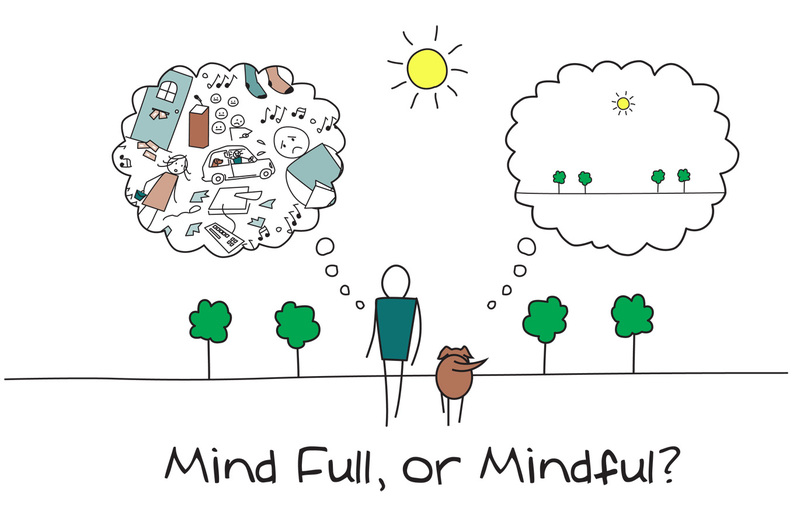 Mindfulness also involves acceptance – paying attention to our habitual thoughts, our feelings and emotional patterns without judging them, or believing that there’s a ‘right’ or ‘wrong’ way to think or feel in a particular moment. Being able to observe rather than react to those patterns can help to manage stress and enhance our sense of wellbeing. When we practice mindfulness, our thoughts tune into what we’re sensing in the present moment rather than revisiting the past, or imagining what might happen in the future. Though it has its roots in Buddhist meditation, a secular practice of mindfulness has entered the mainstream in recent years, in part through the work of Dr Jon Kabat-Zinn and his Mindfulness-Based Stress Reduction (MBSR) programme and Professor Mark Williams from Oxford University’s Cognitive Therapy Centre. 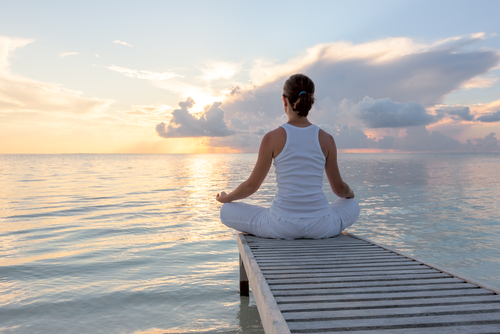 Mindfulness meditation has been shown to positively affect how the brain works and even its structure. People undertaking mindfulness training have shown increased activity in the area of the brain associated with positive emotion – the pre-frontal cortex – which is generally less active in people who are depressed. More than 100 studies have shown changes in brainwave activity during meditation and researchers have found that areas of the brain linked to emotional regulation are larger in people who have meditated regularly for five years. Mindfulness-Based Cognitive Therapy can, on average, reduce the risk of relapse by more than 40% for people who experience recurrent depression. I’ll be incorporating some guided meditations at the end of some of my Pilates classes to broaden the scope of our mindfulness practice.